The first volume of a new series from Toccata almost always generates a sense of discovery. Whilst Krenek’s piano music has not been badly served on disc – I’ve reviewed some before (Capriccio ~ Gasparo) – there is one, albeit brief, first-ever recording in this disc, namely the Prelude WoO87, written in 1944. The other three pieces have all received previous recordings but that doesn’t lessen the interest when they are presented as persuasively as they are here by Stanislav Khristenko. The Piano Sonata No.4 dates from 1948 and is a four-movement work of powerfully contained expression. The conjunction, in the slow movement, of both extrovert and more interior gestures is amplified by Krenek’s precise application of sonorous incident – brief but telling – amidst a generally refined tonal colour. Marked con passione this is the work’s core but the Rondo offers a rather whimsical example of Krenek’s sort-of modified Boogie patterns with the Jazz references powerfully engaged. His ear for the vernacular was, after all, long practised. The finale is a Minuet, perhaps surprisingly – perhaps that’s the point – and its variations, one or two a touch crepuscular, or withdrawn, mark a telling way to end the sonata. The George Washington Variations, Op.120 followed two years later, the result of a commission from a wealthy Los Angeles businessman for his daughter. This genial and clever set of variations takes in the ballroom and subjects its material to deconstruction and reconstruction, as the notes suggest, with much playfulness. Washington’s Grand March is a central focus, and subject to pithy and witty examples of lightly applied atonalism, jazz-hinting rhythms and much more. Playfully ironic in places it in no way outstays its thirteen-minute length. The brief two-minute Prelude packs quite a punch for so short a piece. As Peter Tregear notes in his excellent booklet, the application of twelve-tone is accomplished here with the utmost of lyricism. 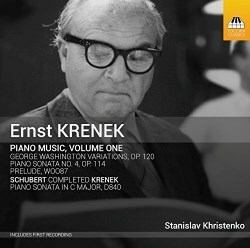 The final piece is Krenek’s completion of Schubert’s Sonata in C major, D840, which he wrote in 1921, just less than a century after Schubert had left it a torso. The first two movements had been completed as had the trio of the Menuetto and the first 272 bars of the finale. It was the pianist Eduard Erdmann, a prominent musician then and later, who encouraged Krenek to take Schubert more seriously. In time he came to understand and share Erdmann’s enthusiasm and undertook a study of the composer’s work. His completion of the sonata is a valuable sidelight to his interests at the time and also of his application of compositional process. As Krenek wrote: ‘in both unfinished movements the thematic material was completely established…so Schubert was [not] still composing by proxy, as it were, but I had only to use my knowledge of, and feeling form Schubert’s style and technique in order to supply what he might have done. I think I did a fairly creditable job.’ He noted that the finale might have been longer had Schubert actually gone through with it. Given the quality of this inaugural volume we can look forward to the second volume with confidence. You should note that Toccata have also recorded a selection of Krenek's music for chamber orchestra (review).